Before I visited Nepal for the Himalayan Travel Mart 2018, I thought the only things there were to see in this country, that abuts the north-eastern states of India, were temples and mountains. 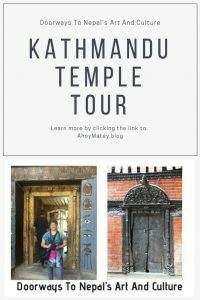 I didn’t opt for the FAM tour that included mountains because I don’t trek, but I did get a tour of Kathmandu’s temples, many of which are World Heritage sites. 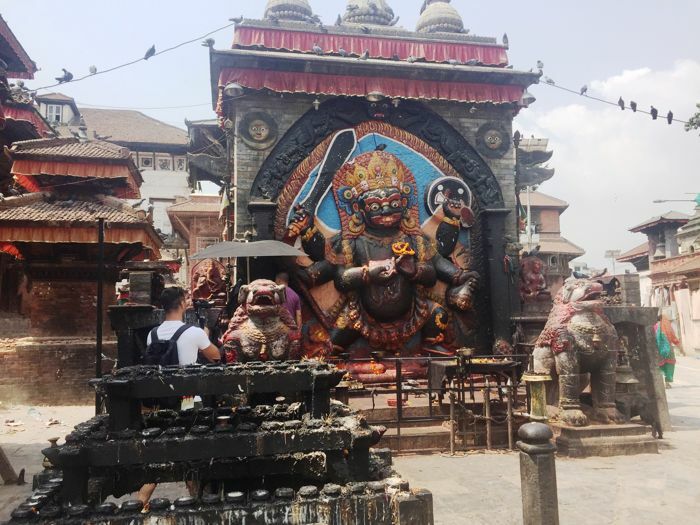 I also learned not to travel to a new place with preconceived ideas, because what I saw on my Kathmandu sightseeing tour was a fascinating repository of Nepalese art, history, culture and tradition. 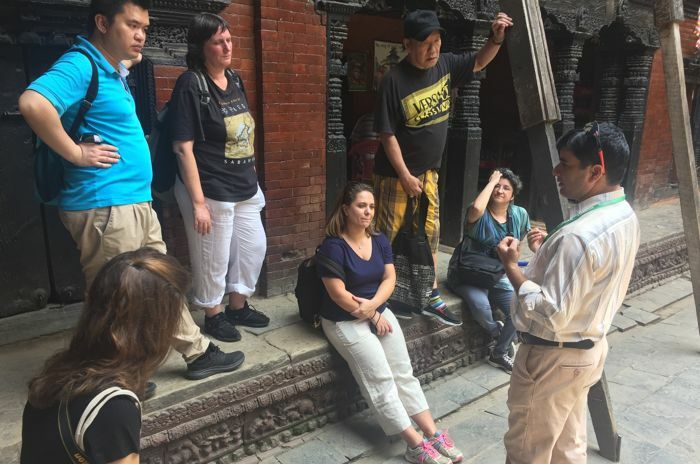 On the first day of our FAM Tour, our tour guides, Mr Badri Nepal and Mrs Sushila Kumari Baral picked us up from the Traditional Comfort Hotel in Kathmandu and took us by mini-bus on a tour of three heritage sites. Most of the cultural centres of Nepal are concentrated around the Kathmandu Valley. 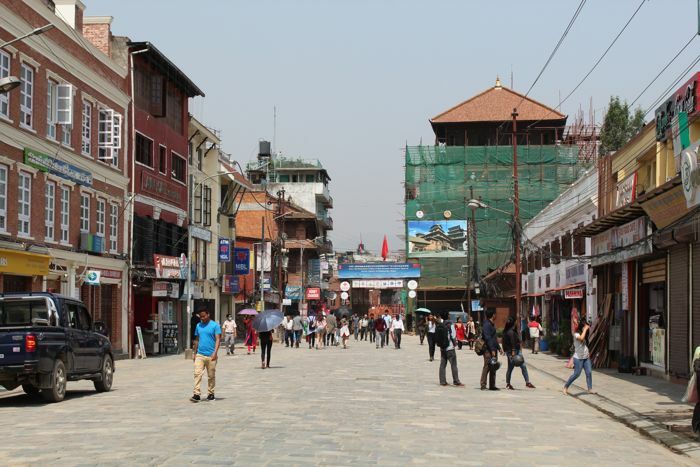 Among those, one of the most important is the Hanuman-Dhoka Durbar Square. 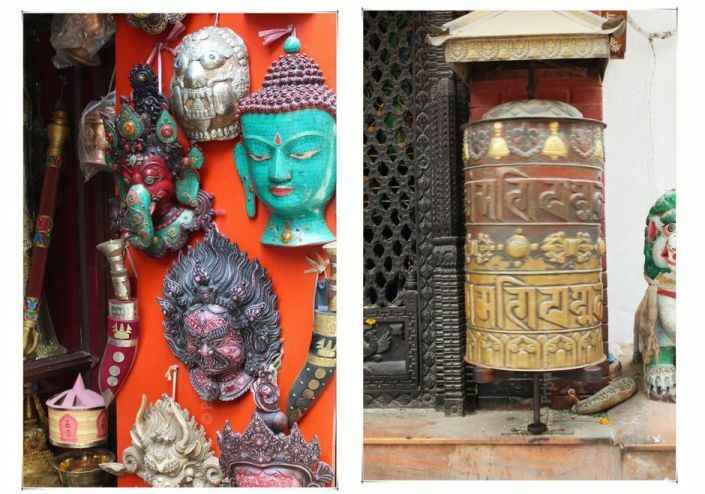 Located in the heart of Kathmandu, this complex of temples and shrines, both Hindu and Buddhist, epitomizes the religious and cultural life of the people of Nepal. It is also called the Kathmandu Durbar Square. 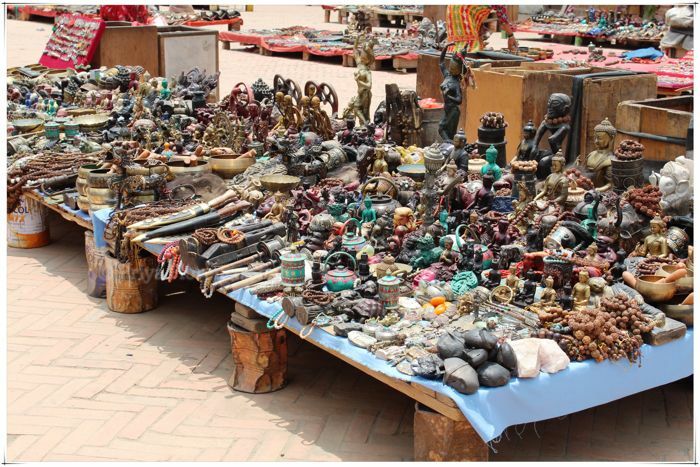 A rich sense of community infuses Nepali life like the smell of incense that spreads through the air in its temples. This sense of community is very important to the Nepalese people. It’s why they are so happy even when they have very little, says Mr Badri. The Durbar Square, with its old temples and palaces, was the centre of the community, a place for people to come together and celebrate. Most of the monuments were built between the 12th and 18th centuries, in the pagoda style, and embellished with intricately carved exteriors. The name Hanuman-Dhoka Durbar came from the kneeling statue of the Hindu god, Hanuman, who is always depicted in the form of a monkey. It sits on a tall stone atop a pedestal and was built by the King, Pratap Malla, at the entrance of the Royal Palace in 1672 A.D. 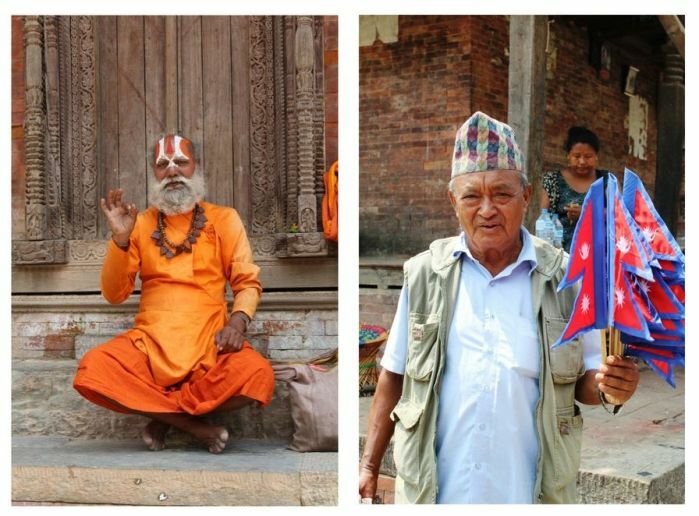 In Nepal, religion brings people together across boundaries such as Hinduism and Buddhism. Many Hindu and Buddhist temples sit cheek-to-jowl here. In India, Hindu temples are usually built in the Sikhara style, while in Nepal, many of them have the Pagoda style architecture. 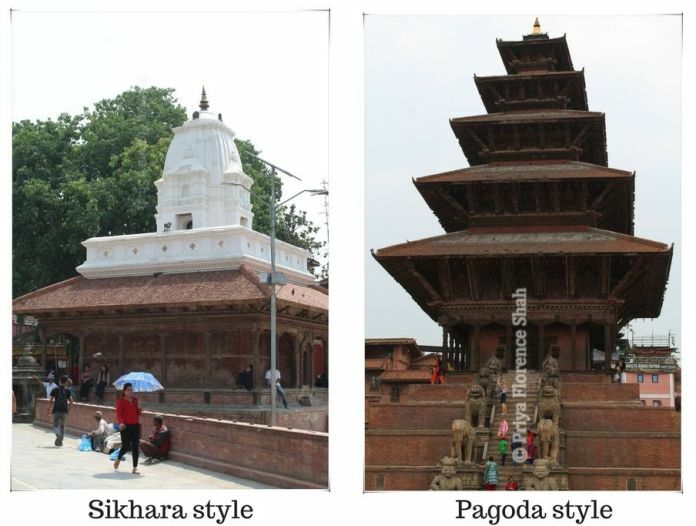 Both styles can be seen in the Durbar Square. This nine-storeyed tower called the Basantapur Darbar was built by Prithvi Narayan Shah in 1770 and renovated many times over the years. 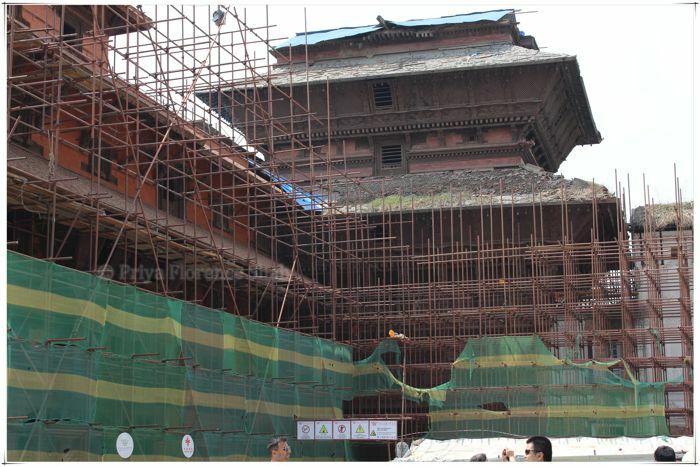 It sustained considerable damage during the 7.8 magnitude Gorkha earthquake of 2015 and is currently being restored with aid from China. 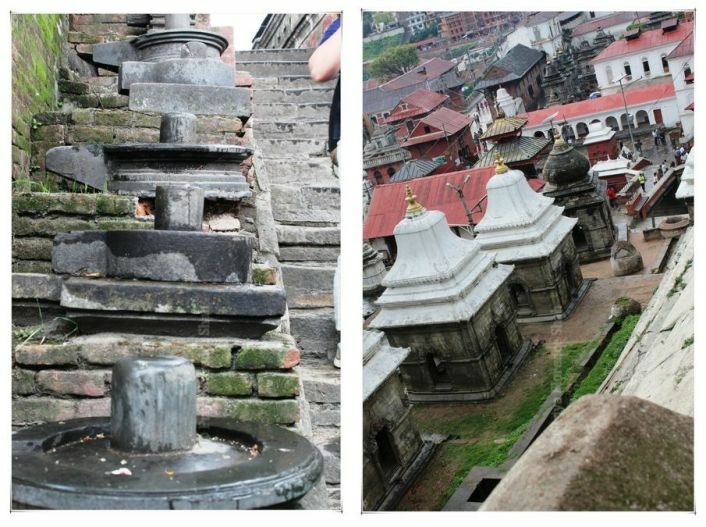 See images of how many of Nepal’s landmarks looked like before and after the earthquake. 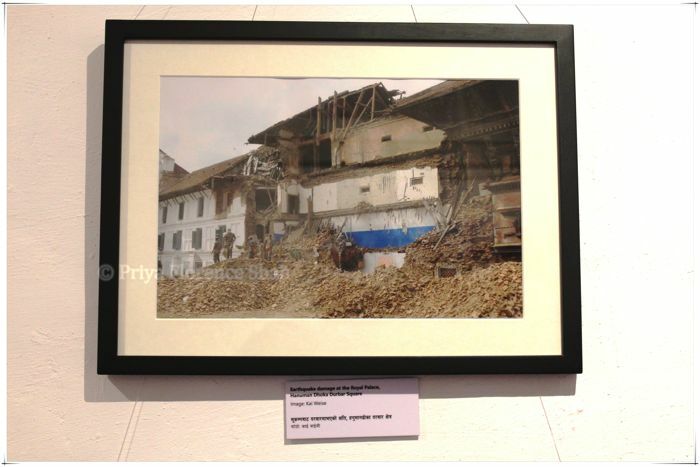 The Hanuman Dhoka Palace Museum also has many artefacts salvaged from the rubble of the earthquake. It is worth a visit if you’re interested in the history and culture behind the monuments that were severely damaged. The Durbar Square is actually made up of two sub-areas. 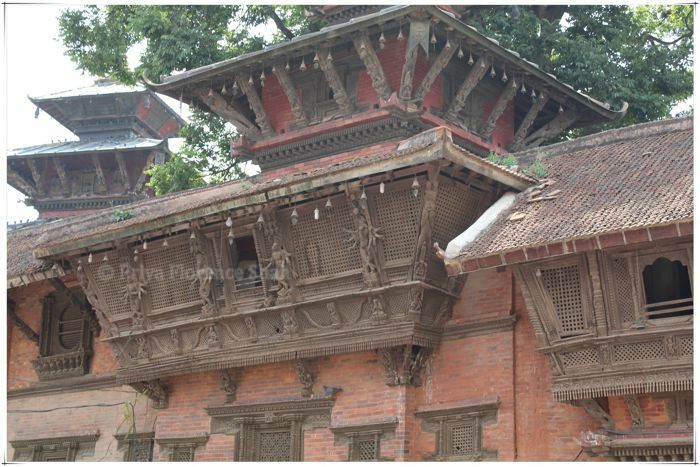 The outer complex has some interesting temples, such as the Kumari Ghar – the home of Nepal’s Living Goddess. It also holds the Kasthamandap, Shiv-Parbati Temple, and the Jagannath Temple. 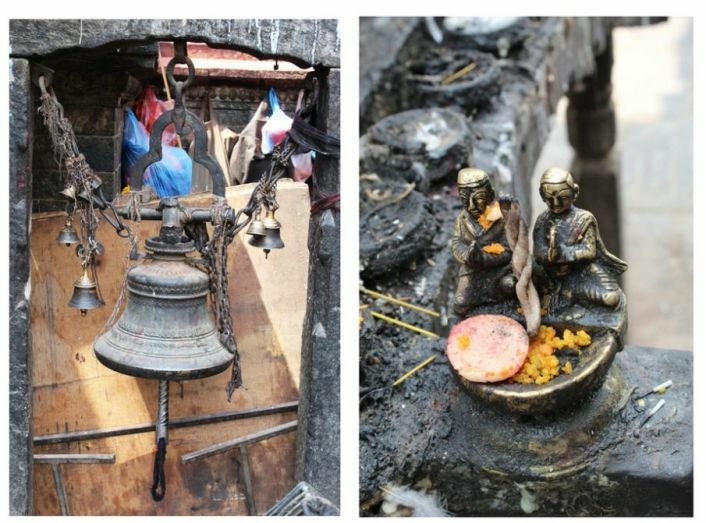 The Kal Bhairav, which represents the god, Shiva, in his destructive manifestation, is used by the government as a place for people to swear the truth. Funnily enough, there’s a small police station aptly located right near this huge stone image. I guess the police can use all the (divine) help they can get in catching criminals. 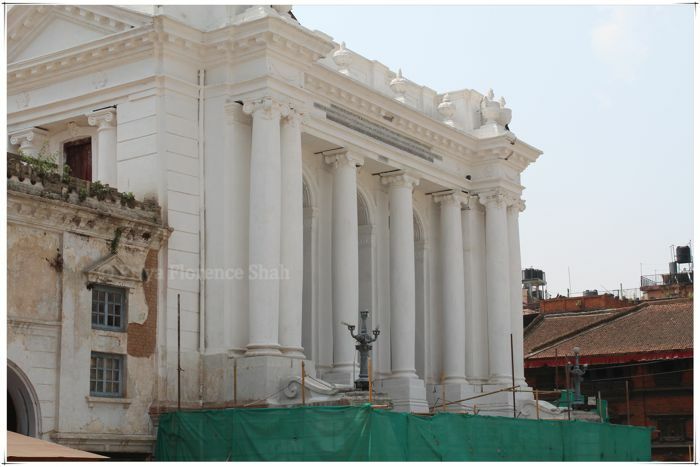 Another intriguing structure in the outer area is the Gaddi Baithak, a building in neo-classical architectural style, built in 2008 by the then King of Nepal, who was fascinated by Western architecture. I thought it looked a bit out of place among the Nepalese temples and shrines. 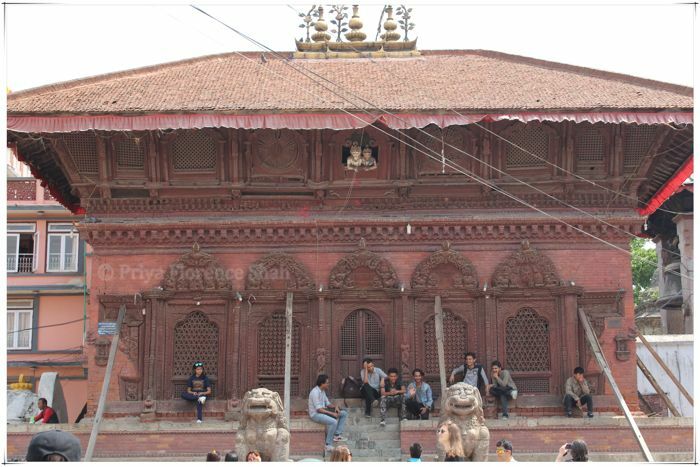 The inner complex of the Durbar Square comprises the old palace area, Hanuman-dhoka and its courtyards. It also holds the Taleju Temple, dedicated to the female royal deity of the Malla kings, which can only be visited by Hindus once a year on the ninth day of Dashain. 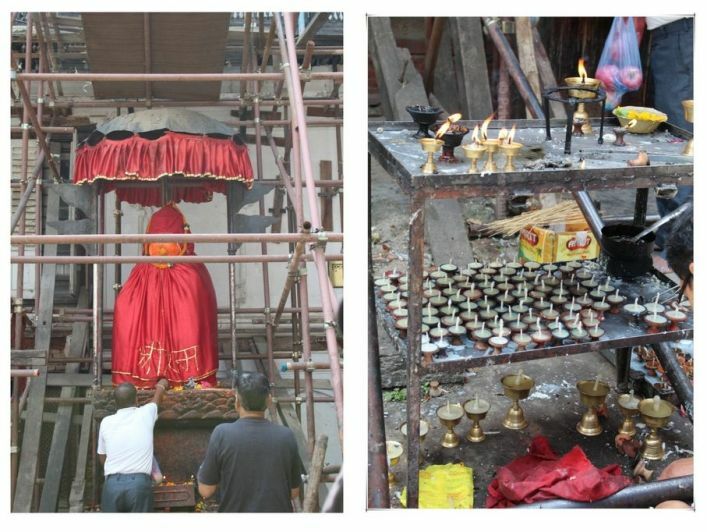 The goddess Taleju, or Taleju Bhavani – the wrathful form of the Goddess Durga – has a special place of worship among the Newar society in Kathmandu. The Kumari or Living Goddess, a controversial tradition practised by ultra-religious Hindus, is a young girl considered to be the human manifestation of the Goddess Taleju. According to the article here, there are several different versions of the myth, but they all point to a Malla king upsetting the Goddess so greatly that she refuses to appear to him in her true form. 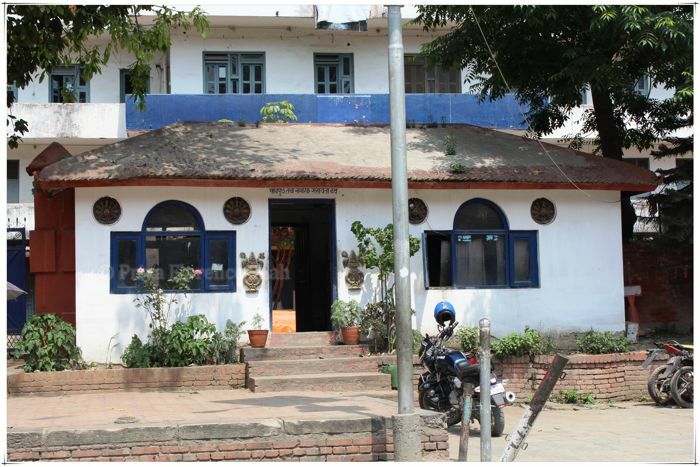 Instead, a young girl is chosen from the Shakya clan, taken from her family, declared a living goddess, and cocooned in her royal chambers (Hindus are allowed to go up into the Kumari Ghar for her blessings, but foreigners are not allowed). There she stays, cut off from all the things a young girl in the modern age would be exposed to – and meeting her parents occasionally – until she begins to menstruate, at which time she is considered impure and goes back to live with her family. Then another newly-weaned toddler is chosen as the living Goddess and the cycle continues. As a mother and a feminist, I found this tradition, and the superstitions that go with it, rather distressing. So it was with relief that I read the Nepalese government will give former Kumaris the monthly allowance of 10,000 Nepalese rupees ($101) from July for the next 10 years. I agree that it would be best to do away with this outdated tradition altogether. But I also commend the government for taking a step forward in a deeply religious society that is not likely to give up its traditions easily. 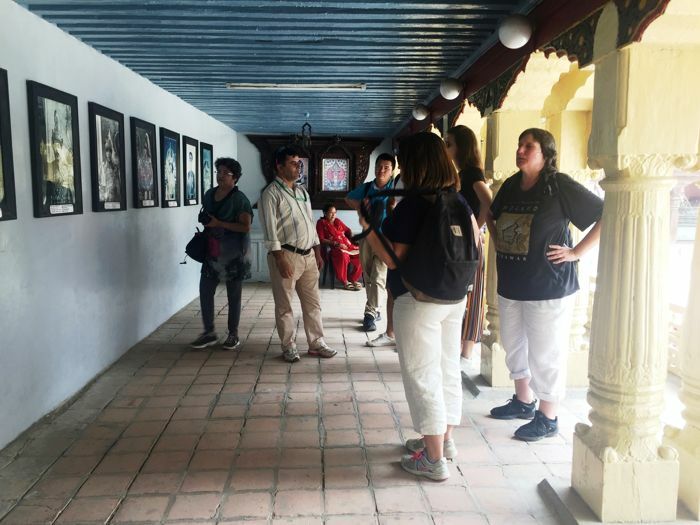 Before we left, Mr Badri took us to a corridor housing the images of all of Nepal’s rulers and gave us a brief history of Nepal’s monarchs and the Nepalese royal massacre in 2001. 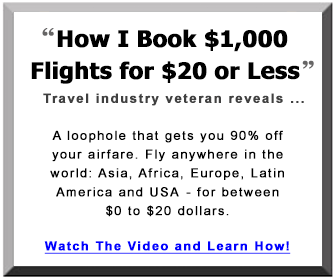 I found myself thinking it was a good thing Nepal abolished the monarchy in 2008. Since we had to stop for lunch, our guide decided to take us to a restaurant at Boudhanath, the location of one of the largest Buddhist stupas in the world and a UNESCO World Heritage Site. When refugees entered Nepal from Tibet in the 1950s, many decided to live around Boudhanath and over 50 gompas (Tibetan monasteries) were built around the Stupa, which is said to entomb the remains of Kassapa Buddha. The Stupa is a very important shrine for the Tibetan community in Nepal and has become the centre of a thriving town of monasteries, craftsmen, and businesses. 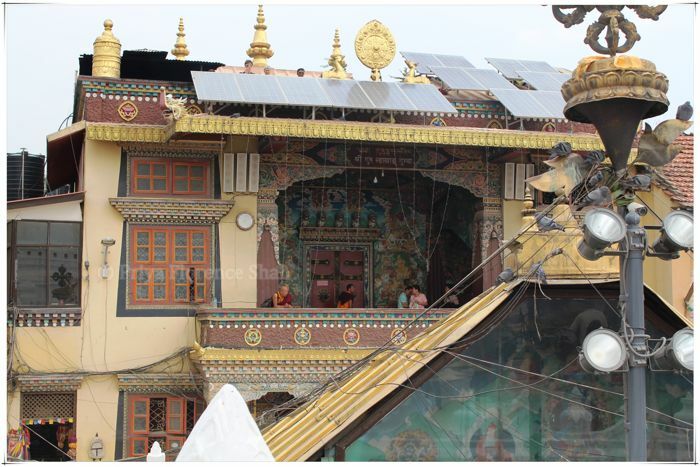 The April 2015 Nepal earthquake badly damaged the Boudhanath Stupa, severely cracking the spire. 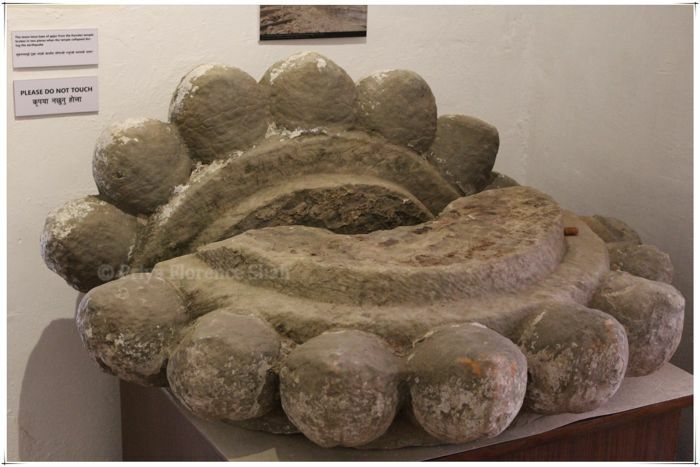 The entire structure above the dome and the religious relics it contained, had to be removed and reconstructed. We made our way up four floors to a rooftop restaurant with a panoramic view of the 100-foot dome of the Boudha Stupa and the courtyard below. After I had a nice thali for lunch, we descended to the courtyard and spent some time exploring the shrine. As we entered the courtyard, the soothing chants of the Tibetan mantra “Om Mane Padme Hum” wafted through the air, while a gong sounded solemnly from one of the buildings surrounding the Stupa. Accompanying this orchestra was the whirring of Tibetan prayer wheels, as hopeful devotees walked around the shrine turning them in prayer, and the fluttering of colourful prayer flags in the breeze at the top of the shrine. On top of a monastery, solar panels gleamed in the sunlight while monks in red robes looked down at the crowd from a balcony. 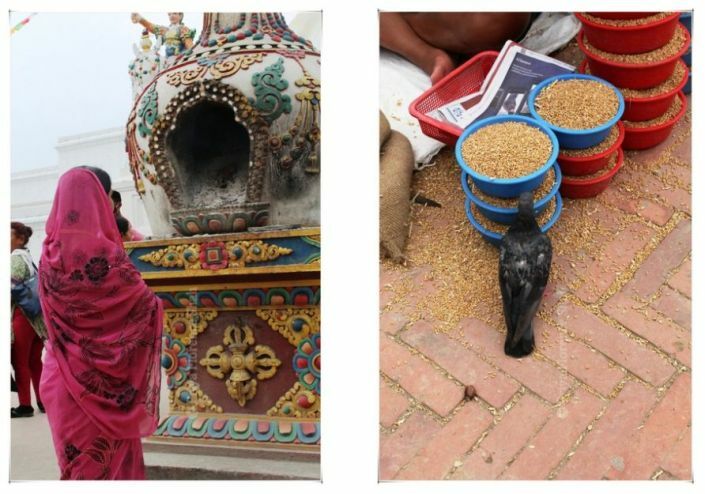 Devotees prayed while animals were fed. Both humans and animals seem to get what they want in this sacred place. 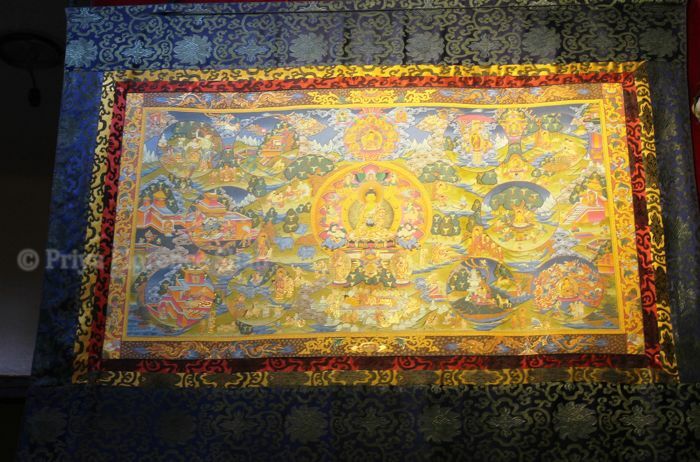 In the windows above the courtyard, painters practised the art of creating elaborate Tibetan Thangka paintings – Buddhist paintings on cotton, silk appliqué, usually depicting a Buddhist deity, scene, or mandala. As I went around the shrine taking photographs, I got separated from my group, so I just waited near the entrance till Mr Badri found me. By this time, the heavens had opened up and a downpour had started, so we decided to hurry on to the next temple – the Pashupatinath Temple. Our next stop was the Pashupatinath Temple, a famous and sacred Hindu temple complex on the banks of the Bagmati River. 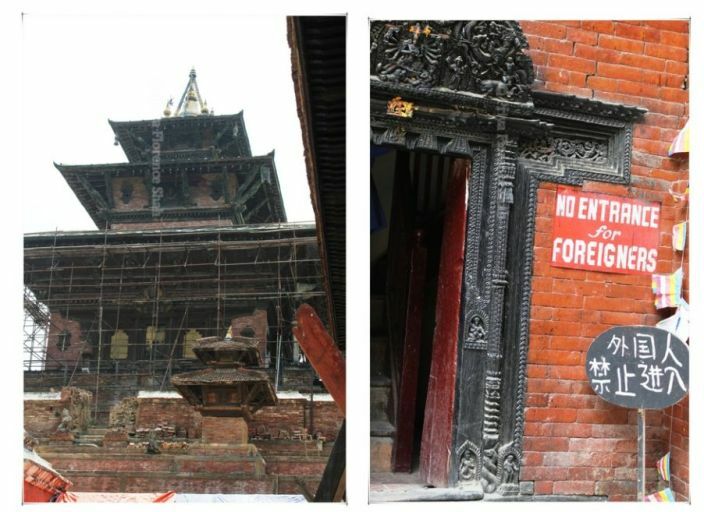 During the 2015 earthquake, the main temple complex and the sanctum sanctorum were left untouched, but some of the outer buildings were damaged. My primary interest in it stemmed from the fact that it was one of the locations for shooting the Marvel movie, Dr Strange, starring Benedict Cumberbatch. Of course, it’s also of interest that this temple complex is on the list of UNESCO World Heritage Sites. Only Hindus are allowed into the main Pashupatinath Temple. For people of other religions, all the other parts of the building are open except the main temple. The Temple’s origins date back to 400 B.C. and the richly ornamented pagoda houses the sacred linga or phallic symbol of Lord Shiva. According to Hindu belief, the twelve Jyotirlinga in India are Shiva’s body and the Jyotirlinga at Pashupatinath in Kathmandu is the head over his body. If you visit this complex, remember that it’s not just a single temple you’re visiting. It’s a sprawling collection of temples, ashrams, images and inscriptions encompassing 264 hectares of land, including 518 temples and monuments. So there’s a lot of walking involved. There’s also a crematorium on the banks of the river that you can visit if you like that sort of thing. I preferred to stay with my group and watch the monkeys that scurried about the complex. 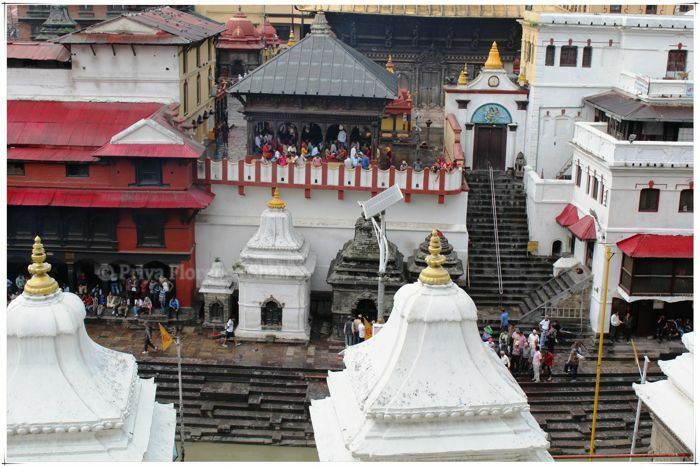 Pashupatinath is another name for Lord Shiva, so about 1 million devotees tend to congregate here on Maha Shivaratri (the Great Night of Shiva), a major Hindu festival. Imagine the kind of organisation it takes to make that happen. 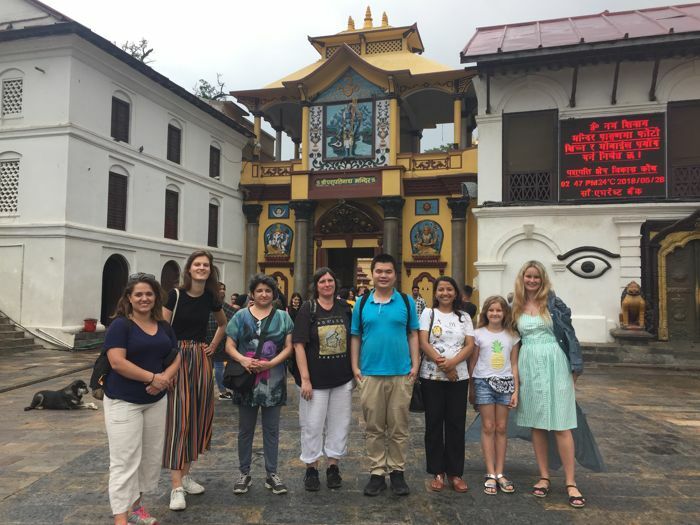 The only reason why we did so much sightseeing in Kathmandu on one day was that it was a FAM Tour and a whirlwind one at that. Personally, I found it very tiring and a bit too much to take in. 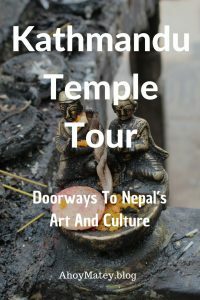 You can make it easier on yourself and enjoy your time more if you spread your Kathmandu city tour over at least 3 days – and spend an entire day at each of these places – because you’ll be walking a lot and there’s plenty to see and photograph. 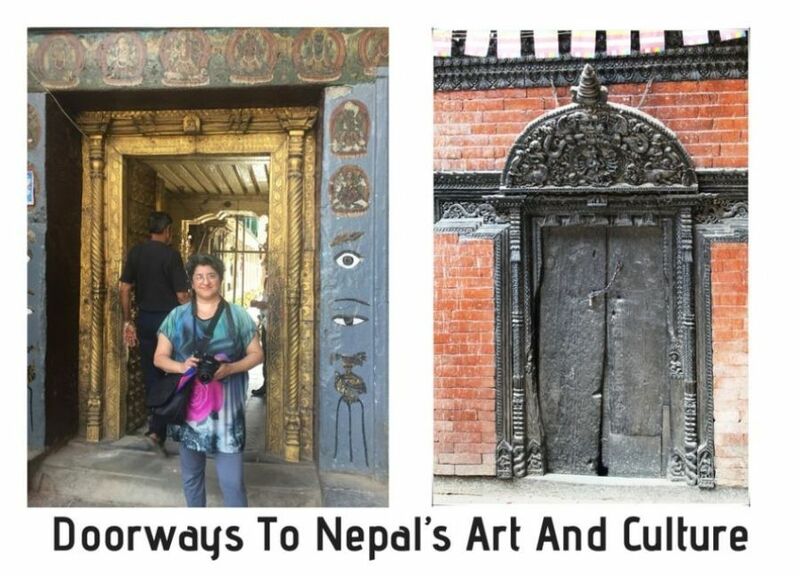 On my Kathmandu sightseeing tour of the temples in Nepal, I witnessed a fascinating repository of Nepalese art, history, culture and tradition. Durbar Square is so neat Priya. Dogs and pigeons, tourists and holy men, women and kids. What a mix. I recall seeing the kindest woman being surrounded by hundreds of pigeons she fed. Bowed and prayed for me. Warmed my heart. She was genuinely happy. Incredibly kind too. Rocking post my friend. Thanks, Ryan. I love these Durbar Squares. They give you an insight into Nepal’s community and culture that you get nowhere else. So much to see, I wish I could have spent the entire day here. 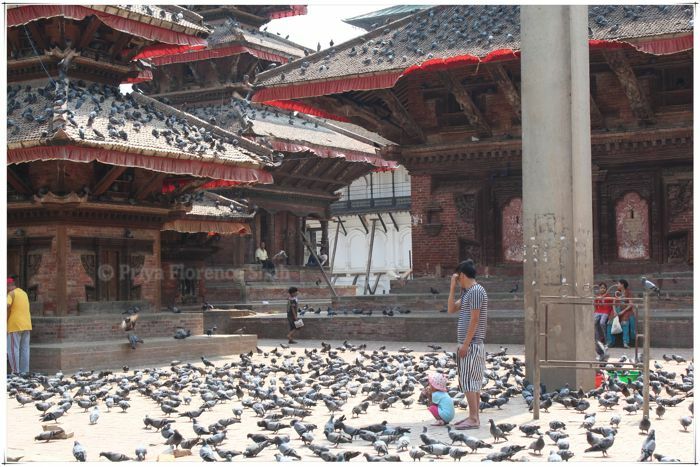 Will write about Patan Durbar Square in another post. That was even more fascinating in some ways. I really enjoyed your photos of the local streets! I think one of my favorite things from traveling is just taking in the everyday life of the local culture & people. Do you know if those flowers have a special meaning or are they for a special occasion? 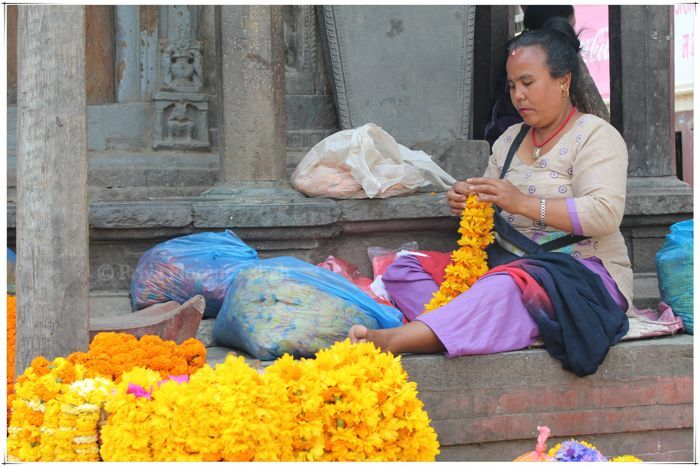 The flowers are used in the temples for worship. Such vibrant colours! These pictures make me envious. Always a fan of detailed architecture and these temples look absolutely beautiful. I loved the woodcarvings and the sculptures. Kathmandu is so beautiful, and has a crazy amount of temples! I visited 5 years ago and your post is making me want to go back! Kathmandu Durbar Square is so impressive. I was very young when I visited Nepal. I remember liking Patan Durbar Square more than the Kathmandu one – I do not remember the reason though. 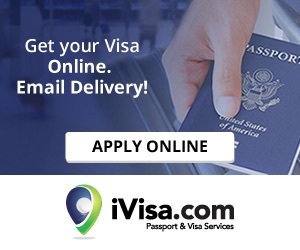 Have you visited that one too? Yes, Shreya, I’ll write a separate post on Patan Durbar Square. I was more impressed with it than the Kathmandu Durbar Square. Nepal is worth a visit, even if you’re not a trekker or adventure lover. So much culture, art and history to see. Beautiful! So full of history and life. One of our dreams is to hike the lower Himalayas and Everest Base Camp, and Kathmandu, along with Namche Bazaar, is the starting point. Wait, monkeys roam freely around the city? Monkeys roam in the Pashupatinath temple, not the main city. Nepal is somewhere I’ll probably never see so I enjoyed reading this. Durbur Square is certainly an interesting spot, and the temples and architecture are interesting too. I also love the photos, they capture the mood well. Thanks. The photos can only capture a small part of the community. There was lots more to see. Nepal looks and sounds like it would be an amazing travel experience. 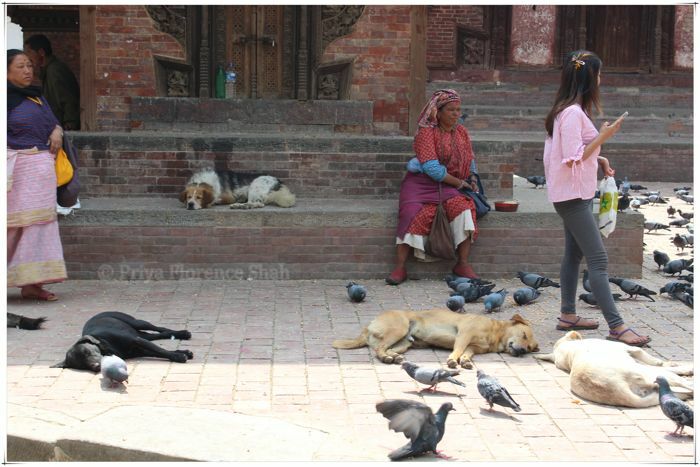 I really liked the photo of the dogs and pigeons coexisting peacefully! There seem to be a lot of temples to visit there and some very talented artists. 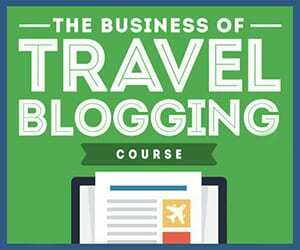 Looks like a great trip and memories. Yes, it was, Sara. There’s a lot to see for people who love art, culture and history. Nepal seems so stunning and definitely worth exploring, Priya. This tour, in particular, seems like a must do when being there. Your pictures are truly exceptional. How long does this tour last? Just 2-3 days as compared to some of the other FAM tours that were 10-11 days. I was in Goa before the trip, so had to opt for the short one.